According to Hitchhiker’s Guide to the Galaxy, a towel is the most massively useful thing an intergalactic traveller can have. In my case it is definitely the towels close cousin, a sarong. Since arriving in Bali not quite 20 years ago (!) where I purchased a blue sarong with white fish on it, I have never left home without it. It has huge practical value – at its most basic it has served as my towel, a bed sheet and a bag. It has occasionally been worn as a dress or skirt. It regularly took on bunk screening duties in Central America and even got to lay out with me on a beach once in a while. I have not used it wet in hand-to-hand combat as the Hitchhiker’s Guide suggests, but you never know. 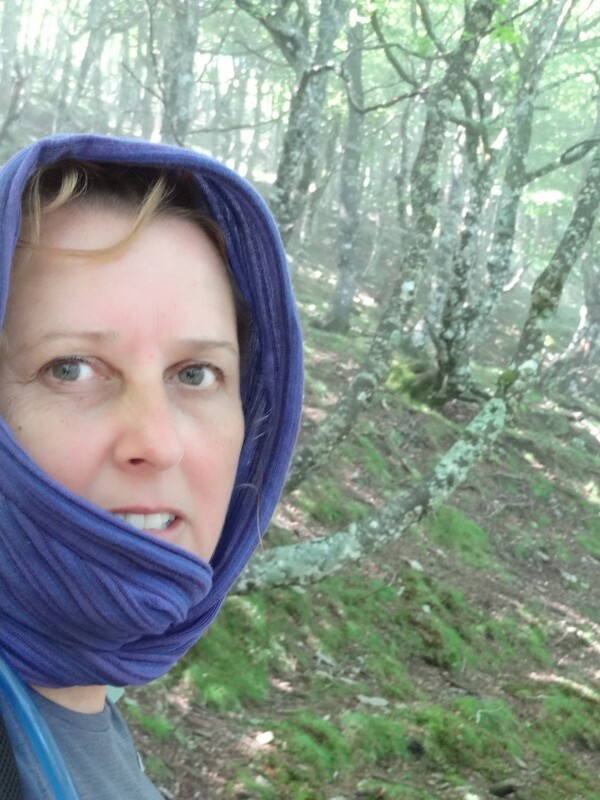 Current duties on the Camino means it is looped through the top of my backpack and then two corners attached to my walking poles, serving as a portable tent to protect me from the sun, whilst still letting in the breeze. I alternately look like a Mexican bandito or Mary Magadelena depending on which angle you catch me from. Another Hitchhiker’s Guide use is to wrap it around your head to avoid the stare of the Ravenous Bugblatter Beast – if you cannot see it, it thinks it cannot see you. 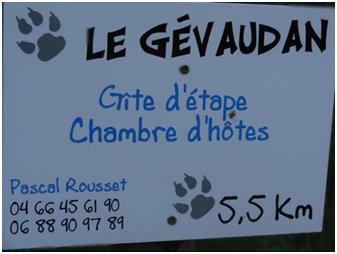 Now I am quite sure this is a fictional character I do not have to worry about, however I have been wandering through some pretty isolated and lonely forests and every now and then I get a reminder (like the sign pictured here) that this is the world of Le Gévaudan. The story goes this is an animal which roams the woods in these parts and has been held responsible in times gone by for the disappearance of some 50 plus people. My first encounter with this creature was in Sauges where the beast had stepped in some paint and its huge paw marks wander straight through the town centre to the church (where else would a big cat be going?). The next day walking on the way to St Alban, a monstrous dog trotted by, eyeing me suspiciously and carrying a sheep sized carcass in its mouth… le Gévaudan? I think not, more likely an impostor, but I will be keeping my sarong handy.